Composite shaker screen is different with common steel framed or supported screen. The main structure is composite one consisting steel tube, plastic material, etc. Composite screen usually means the shaker screen with composite frame. The composite frame include internal steel frame and plastic injected. Internal frame is made of carbon steel tube and rod. 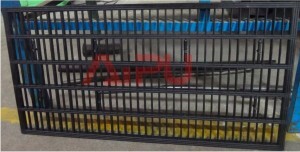 We also can make the internal support frame with aluminum alloy tubes. Aluminum alloy tube will be much lighter than steel one, but we trust steel tube frame will be more strong during injection and higher adhesive force. The composite frame screen will be finished by heat press. Usually, we put wire cloth on composite frame and vulcanizer plate will press them together by very high temperature (about 200℃). Of course, we should pay attention on the heating time. It will affect appearance and whole screen quality reflect on blanked area. Now, there are also different manufacturer produce the composite screen for Derrick 48-30 shaker, King Cobra shaker, even some of them produce pyramid composite screen. We are not sure about the quality of different type screen from different producers. But we do appreciate the R&D capability and the invention attitude. We trust under long time practice we’ll get actual result. 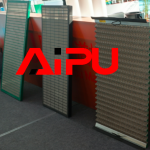 Presently, Aipu produce the Mongoose composite screen replacement, King Cobra series composite screen, VSM300 primary composite screen, M series composite screen for our own shaker. Now we are adjusting our Mongoose composite frame mould. The adjustment will be finished in 1 week. Please feel free to contact us if you are interested in composite frame shaker screen. We trust you will get satisfied solution with lower cost.